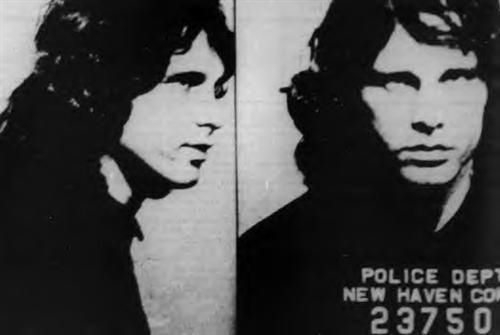 Jim Morrison had several brushes with the law throughout his life. 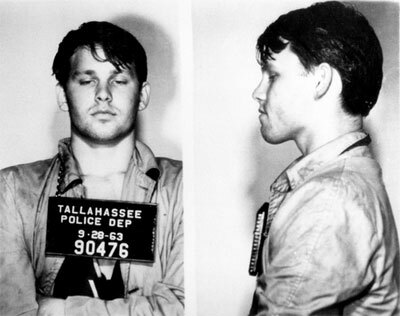 Here’s a breakdown of Jim’s extensive rap sheet..
Jim’s first arrest was on September 28, 1963 in Tallahasee, Florida with charges of petty larceny, disturbing the peace, resisting arrest and public drunkenness at a football game. Jim was allegedly, getting rowdy and making fun of the football players and people in the crowd. He then apparently, stole an umbrella and an officers helmet from the open window of a police car. The charges were eventually dropped and he only had to pay a small fine. Jim next arrest was on December 9, 1967 in New Haven, Connecticut. He was booked on charges of indecency, public obscenity, disturbing the peace and resisting arrest. This arrest was portrayed in Oliver Stone’s The Doors movie. Jim had met a girl in his dressing room and wanted a bit more privacy so he went into a shower stall with her. A police officer spotted them in the bathroom and told them they had to leave. Jim told the officer he was in the band and told him to go away. The cop got pushy with Jim, Jim tried to push him away and then the cop maced him. The police wanted to arrest Jim on the spot but were afraid it would incite a riot if the concert was cancelled. During the last song, “Backdoor Man“, Jim told a story about what happened backstage. 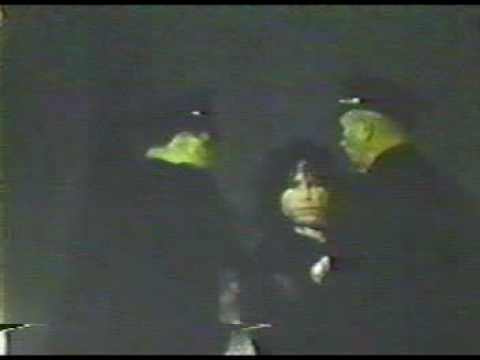 The cops shut the music down and came directly onstage to arrest him to arrest Jim. 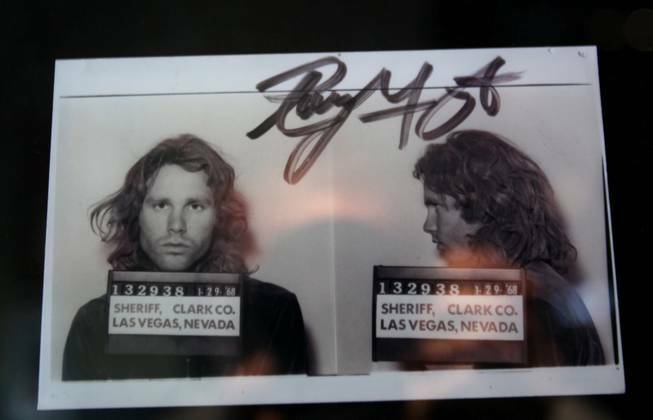 Jim’s next arrest was at about midnight on January 28, 1968 in Las Vegas, Nevada. Jim was arrested at the Pussycat a’ Go Go for public drunkenness and vagrancy. Apparently, Jim was beat up by the bouncers because he was smoking a cigarette like it was a joint. One of the bouncers hit Jim over the head with a billyclub which caused Jim’s head to bleed. Chaos ensued and the cops arrived and Jim was arrested. On the ride to the station and while being booked, Jim was livid and incited the cops who threatened to beat him up after their shift ended. 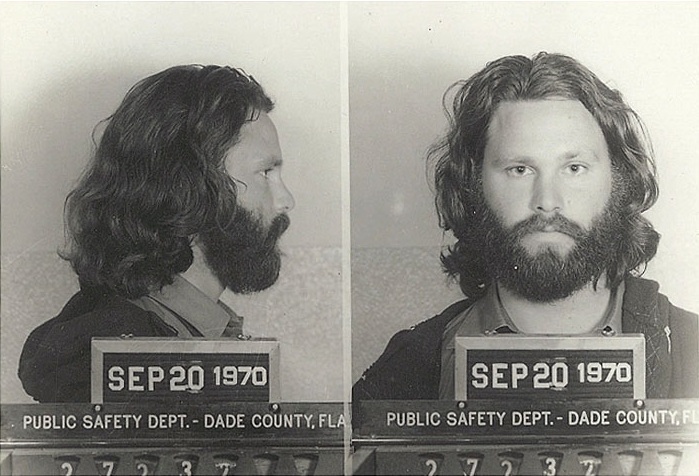 Jim’s next arrest was on March 1, 1969 in Miami, Florida. Three days after performing at the Diner Key Auditorium, Jim was charged with a felony and five misdemeanors and a warrant was issued for his arrest on March 5, 1969. The felony was for lewd lascivious behavior, two misdemeanors for public profanity, two for public exposure and one for public drunkenness. Police said Jim exposed himself on stage although there is no evidence. The legal wrangling went on until the day he died. Jim’s next arrest was on November 9, 1969. Morrison was booked into city jail for drunk and disorderly conduct on a flight and interference with a flight crew and attendants. Jim and friend Thomas Baker flew on Continental Airlines to Phoenix, Arizona to see The Rolling Stones who were to play at Veterens Memorial Coliseum on November 11, 1969. Morrison and Baker were accused of using vulgar language and throwing glasses inside the Continental Airlines aircraft while it was in flight. Before his Arizona arrest, Arizona state officials “Blacklisted” The Doors from every playing in Phoenix again after accusing Jim Morrison of almost causing a riot during a concert on February 17, 1968 with alleged obscene remarks and gestures. 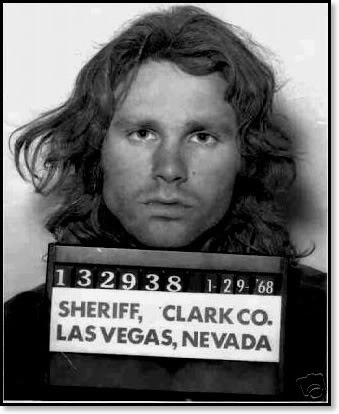 Jim’s next and final arrest was on August 4, 1970 in Los Angeles, California for suspicion of drunkenness. He was found asleep on the front porch of the West Hollywood home of Elenor Brough at 7:00AM in the morning. She discovered Jim when she opened the door to get her morning paper. Jim was released on $25 bail and was scheduled for court in Beverly Hills.